Airman Spencer Stone, hero of French train attack, in critical condition after Sacramento stabbing: Report. 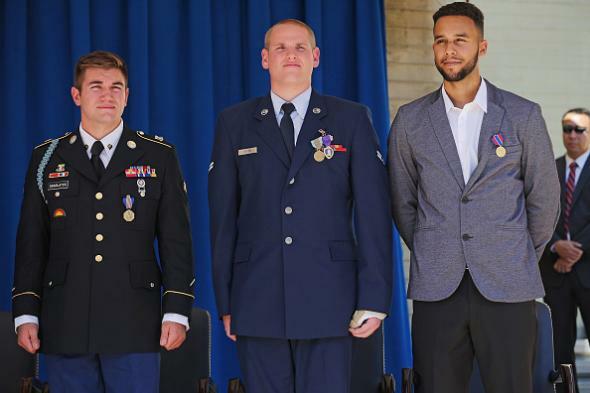 Spencer Stone (center) with Alek Skarlatos (left) and Anthony Sadler at a Pentagon awards ceremony on Sept. 17, 2015, during which Stone was awarded a Purple Heart. Hometown hero Spencer Stone was stabbed multiple times early Thursday morning near several popular bars in midtown Sacramento, KCRA has confirmed with the U.S. Air Force. The stabbing happened about 12:45 a.m. near 21st and K streets, Sacramento police said. Stone was 23 on Aug. 21 when he and several others (all of whom later received the French Legion of Honor medal) confronted and subdued a 26-year-old Moroccan man named Ayoub el-Khazzani, who was armed with an AK-47, a pistol, and a box cutter on a train traveling from Paris to Amsterdam. Stone was reportedly the first to tackle el-Khazzani and was hospitalized after being slashed during the ensuing struggle. He was given a Purple Heart medal at a Sept. 17 Pentagon ceremony.